This is the Premium Plus paperback edition of The Shape Shifter published by Harper in 2008. The front cover features the author's name and title lettered in gold, with the Yei figure drawing by Peter Thorpe from the hardcover edition against a red and gray pattered background similar to a Navajo rug. The author's name, the Yei figure, and the title are printed on the spine. 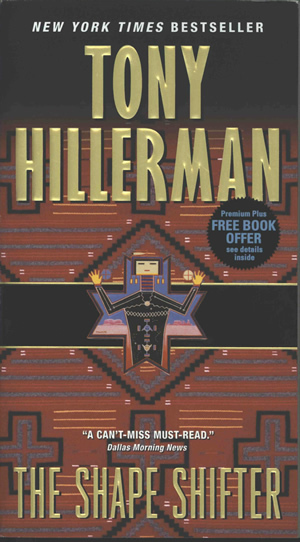 The back cover contains a quote from the Santa Fe New Mexican, the novel synopsis, publisher and Tony Hillerman Web site addresses, the barcode and price. Binding: Full-color paper covers. The author's name and title are printed horizontally on the spine in yellow.